We are eager to learn from other cultures, but usually not when it comes to making our homes safer or more age-appropriate. Our food preferences are another story. We don’t hesitate to stock our kitchens and cupboards with the ingredients we need for a healthy Chinese stir fry or Turkish couscous. If only we were as willing to think cross-culturally about aging in place. We can learn a great deal about home safety from the housing, home-furnishings and design options offered across the world, especially in other nations with rapidly aging populations. Aging in place is a more creative process than it has ever been before. The beauty of globalization is that it gives us a world of options for designing our homes. To paraphrase Burger King, we can truly “Have it our way,” as we prepare to age in our homes. I learned this lesson well when Wid Chapman and I were writing Home Design in an Aging World. Architect Wid Chapman and I decided to write a book to make cross-cultural comparisons of environments where people age-in-place: everything from apartments, detached and semi-detached homes, to traditional farmhouses, communes, and high tech dwellings. In 2009, we surveyed homes and home furnishings available to older people in seven of the world’s most rapidly aging nations: Japan, Sweden, China, Brazil, Israel, the United States, and India. By the year 2009, all 7 of these nations were being reshaped by what the Japanese call The Silver Tsunami, and what we describe as The Age Wave. We decided to do a comparative study of design and architectural responses to global aging. This led to the publication of Home Design in an Aging World (NY: Fairchild, 2010). The book remains one of a handful of cross-cultural comparisons of architecture and design for aging-in-place. Chapman and I have asked how architecture and design respond to kinship norms. How is aging-in-place shaped by Hindu kinship, which is strongly patriarchal and multigenerational? Or by the sensibilities of Sweden, where fertility is quite low and people typically live in nuclear households? As environmental gerontologists, we were curious about the impact of age-related norms on aging-in-place. For instance, would aging-in-place be discouraged in Brazil, one of the world’s most youth-oriented societies. And how about Japan? Unlike Brazil, Japan, is a gerontocracy where elders and old age are honored, and where pride of place in their children’s homes is enjoyed. What is the impact of the high U.S. divorce rate and small family size on our own architecture and design for aging-in-place? Chapman and I focused on both Western cultures (USA, Israel, and Brazil); and also on cultures where non-Western architectural norms and traditions are still in play (Japan, China, and India). What follows are some examples of how constructed environments and local technologies interact with social norms to affect the experience of aging-in-place. Learning from other cultures involves appreciating that there is often a mix of traditional home design – what architects call “vernacular design” – and cutting-edge technologies such as robotics. New technologies, combined with strategic changes in homedesign, are making it easier than ever before to age in place. People on the cusp of retirement can build upon new technologies to create everything from home offices to home care for a variety of chronic illnesses. What follows is a very brief look at “lessons” drawn from other cultures, ranging from low-tech/high-touch to high-tech/low-touch, and from ancient to post-modern. There is an old Japanese saying which goes, “May you live and die on tatami.” This refers to the bamboo mats which cover traditional Japanese homes from wall-to-wall. Home-furnishings in traditional Japanese homes are low-slung or actually on the floor. The futon is perhaps the most familiar example of this approach to home-furnishings. Low, traditional Japanese home furnishings are of ten moved from room to room as needed. This occurs on the tatami mats which cover the floor of a traditional Japanese home. The floor-based Japanese design aesthetic features low-slung furniture and futons for sleeping that make any home safer. Apart from reducing falls, floor-based lifestyles enhance strength and balance. My sources tell me that even the most contemporary homes in Tokyo or Osaka contain a “Japanese Room” with traditional tatami mats on the floor, and Tokugawa detailing throughout. Apart from being reverent about its past, Japan is also a world leader in technological innovation. Japanese homes often contain a mix of products and technologies that hark back centuries, as in the case of traditional tea-sets or futons, and also look ahead to a robotic future. For example, there is a growing number of Japanese households with robotic pets – mostly dogs. Futurist Timothy Horynak (2006) claims that the interest in robotic house pets reflects Japan’s passion for incorporating the newest of technologies with time-honored canons of Japanese design and home life. Robotics is the product of digital design and innovation. 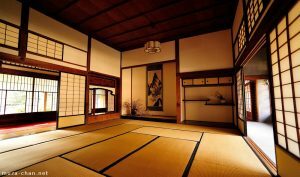 Tatami dates back centuries. That they exist together in some Japanese homes is a reminder that Japanese proudly mix tradition and technology. This may be the new face of aging in place in Japan and elsewhere in the world. Brazilian architect Sandra Perito, from Sao Paulo, has designed Senior Housing that is intended to prevent domestic accidents, especially falls (Rosenfeld and Chapman, 2012). Perito routinely adds a built-in table on the front porch or entry to a home. Perito makes sure that this Entrée Table is as close to the front door as possible. In apartment buildings for Brazilian Seniors, she does much the same. The idea behind Perito’s Entrée Table it Seniors a place where they can place packages, bundles, or a purse while searching for their keys. The inspiration came from a elderly woman from Sao Paulo who lost her balance while rummaging through her purse in search of her keys. Perito adds this reminder: her table also functions as a grab-bar for additional balance while locking or unlocking the front door. 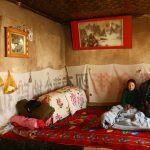 On a trip to Scotland many years ago, I visited a number of homes in the Scottish Highlands where people either had very small refrigerators, or no refrigerator at all. Those without refrigerators kept perishable items in their cellars. The climate in the highlands is such that the home’s basement is always cool enough to put perishables for a day or two. Philip B. Stafford, author of Elderburbia: Aging With A Sense of Place in America offers the following advice: It is best for older people to have small refrigerators. It has nothing to do with household size, he says. Very simply, people with small refrigerators must leave home more frequently to do their grocery shopping. The small refrigerator is an antidote to isolation. User-friendly technology provides feedback at home, and also when the user is at work or on vacation. 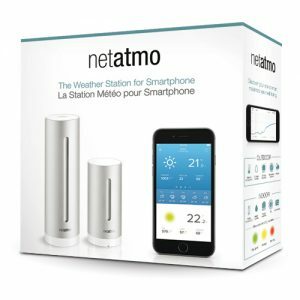 The user can be far from home and rely on Netatmo’s personal weather station to keep track of the weather at home. The personal air-quality sensor does the same for levels of air-pollution in and around the house. The product line also includes a Smart thermostat and a Smart security camera with facial recognition. As more people opt to age-in-place, Netatmo provides the technology for safety and security. In 2015, Singapore company RoboCoach, Inc., introduced a robotic “exercise coach” at five of Singapore’s Senior Centers. The RoboCoach has a smiling face and appendages that mimic human movements. The robot has been developed to “teach” Seniors a range of exercises while offering verbal encouragement and support. According to The Guardian, the company predicts that RoboCoach will become a popular fixture in many of Singapore’s Senior Centers and Senior Living Facilities. The goal is to enable the elderly to lead more independent, fulfilling lives. Understand the symbolism and social meaning of color in the architecture and design for every culture. Oliver Holmes, Singapore Introduces a RoboCoach to Keep Older Citizens in Shape, The Guardian, October 15, 2015. James Griffiths, Singapore Turns to Robots to Get Seniors Moving, CNN On The Road, October, 2015. Timothy Horynak, Loving the Machine: The Art & Science of Japanese Robots, Tokyo: Kodorashi Press, 2006. Philip B. Stafford, Elderburbia: Aging With A Sense of Place in America, NY: Praeger, 2006. About the Author: For the past 10 years, Dr. Rosenfeld has been researching the interplay of ethnicity, aging, and home design. He is currently looking at home design and community-building by Brooklyn’s “New” ethnic elders from Korean, India, Pakistan, and Guyana. Along with architect Wid Chapman, AIA, he has written Home Design in an Aging World (Bloomsbury, 2010), and UnAssisted Living (Monacelli Press, 2012). Dr. Rosenfeld is also currently working with the research arm of New York Methodist Hospital in Park Slope, Brooklyn. He is looking at ethnic differences (incidence and prevalence) of serious geriatric falls in the home. 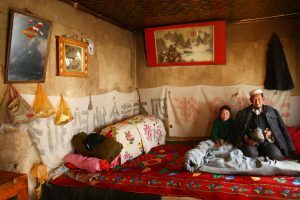 The goal is to better understand how ethnically-themed design contributes to ethnic disparities in home injury. Dr. Rosenfeld has been on the adjunct faculty at Brookdale Center since May, 2015. He can be contacted through Parsons School of Design at Rosenfej@NewSchool.Edu; 347-249-4014.